100% Genuine, Real Sheepskin Insoles Oh that bugs me! I am talking about that seat belt digging into one's neck. Time to put a stop to that with our genuine sheepskin seat belt covers. Featuring a full foot of luxurious Australian Sheepskin that wraps around the seat belt and easily slides to the desired location. Ahh! That feels much better! Need some warm gloves? Look no further, our 100% Genuine Australian Sheepskin gloves will keep your hands warm on the coldest of days. On those days it is not super cold they will not be too warm. The natural properties of sheepskin allows your gloves to breath eliminating any moisture from forming. 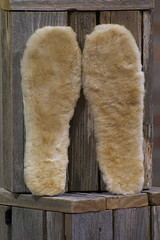 The lanolin that naturally occurs in sheepskin will not dry out your skin. 100% Genuine, Real Sheepskin Steering Wheel Cover Super Protector Resists Rain and Stains.